Inuit are the indigenous inhabitants of an Arctic region that crosses Canada, Alaska, Russia and Greenland. In April 2009, Inuit came together from across the Arctic Circle and issued a declaration establishing their rights to self-determination. In a leap forward for indigenous self-rule, in 1999 the Canadian government created an Inuit majority territory, Nunavut, meaning “our land” in the Inuit language. Covering 1.9 million square kilometers and home to 29,000 residents, most of them Indigenous, its decentralized government allows Inuit to take control of their own affairs. Worldfocus spoke with Stephen Hendrie, the Director of Communications at Inuit Tapiriit Kanatami, Canada’s national Inuit organization based in Ottawa, about the issue. Worldfocus: What has been the impact of the creation of the territory of Nunavut? Hendrie: The creation of the Nunavut territory — the biggest jurisdiction in the Americas with an aboriginal majority — remains an inspiration. The territory garnered international headlines when it changed the map of Canada on April 1, 1999 for the first time since 1949. People always look to the Nunavut territory as the place where most Inuit live in Canada. In fact less than 50% of Inuit live in Nunavut. The three other Inuit regions in Canada– Inuvialuit, Nunavik, and Nunatsiavut– have either established a regional government (Nunatsiavut), are on the verge of doing so (Nunavik), or continue to work on a form of one (Inuvialuit). The 53 Inuit communities located in “Inuit Nunangat” (the region Inuit in Canada describe as the Inuit homeland located in the Inuvialuit Region of the NorthWest Territories, Nunavut, Nunavik in Northern Quebec and Nunatsiavut in Labrador) enjoy unique forms of power-sharing within Canada through the provisions of comprehensive land claim agreements (modern ‘treaties’). These agreements, which define power-sharing arrangements governing public administration and the ownership, use and management of natural resources, have Constitutional protection. When you look at the picture overall, Inuit have achieved extraordinary advances within the Canadian political landscape, and that has been done in a peaceful manner over the course of the past 35-40 years. The push for further advances continues, with key issues being economic development, overcoming a legacy of problems in relation to the core social services of health, education and housing, and the preservation of the Inuit language. Worldfocus: How much is the traditional Inuit way of life changing in response to modern pressures? Hendrie: What if this question were turned around? What if “Westerners” were surprised to learn that the Inuit perspective to this question is that the “Western” way of life is being adapted by Inuit in the service of preserving the traditional Inuit way of life? Inuit didn’t stop hunting when ski-doos were introduced. Inuit simply hunted more efficiently. Inuit don’t see an Internet dominated by English as merely a threat. Inuit are using the Internet to preserve language and culture. See isumatv.ca for an example of the internet in use as a tool for the preservation of Inuit language and culture. 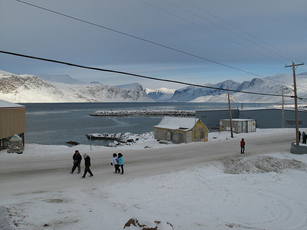 Worldfocus: How would you compare the condition of Inuit in Canada with those in Alaska? Hendrie: Inuit in Canada and Alaska face many similar challenges, such as the need to ensure adequate Inuit control over major non-renewable resource development projects, the need to overcome gaps in basic living conditions, the challenge of preserving language and culture, and combating the efforts by internationally organized animal rights extremists to undermine the livelihoods of hunting peoples everywhere. Inuit in Canada and Alaska do live in larger societies with different Constitutions and political traditions, and these differences color Inuit realities and priorities in the two countries. For example, Canadian Inuit have access to universal public health insurance and a history of much greater access to public housing; Alaskan Inuit have demonstrated the high level of entrepreneurial initiative characteristic of American society in general. Thanks for pointing out the error, we have corrected it. Inuit is a plural noun. It does not require an “s.” Inuk is the singular form. I am the nearly unknown architect of the 1971 Alaska Native Claims Settlement Act. I was the attorney for the Alaska Federation of Natives, the Tanana Chiefs Conference and many Interior Alaska villages. ANCSA was achieved with the secret support of President Nixon, “Whatever they (Alaska Natives) want, let them have it”. Accomplished over the opposition of the Interior Committee Chairmen, Representative Wayne Aspinall and Senator Henry Jackson, they took revenge (in my opinion corruptly) on the attorneys for Alaska Natives. I want to write the secret, unknown history of achieving ANCSA, but I have not been able to raise funds. At 80, I still practice, as a solo lawyer, but my practice, Social Security Disability appeals, is not now even covering living costs, and my savings are nearly exhausted. I have no retirement income, except Social Security, Medicare, and the Marine Corps supplemental medical.